Today we wear black, and enter a dark period of mourning. We struggle to accept this harsh concept of death, and naively pray to the gods for some sort of miracle. We’re not grieving for one particular person, but rather for the loss of an entire coral ecosystem off the coast of Australia. An ecosystem that had previously thrived for 25 million years. Suddenly, a hand reaches out of the darkness and slaps us in the face in a swift and dramatic motion. “The Great Barrier Reef isn’t dead yet you damn fool,” says the strange mysterious voice, as we struggle to regain our composure. Earlier this week, a cheeky obituary was released by Outside magazine that sensationally declared the death of the giant reef in Queensland, Australia. The article quickly spread on social media, with The Sun and the New York Times adding fuel to the fire. While it appears the Great Barrier Reef isn’t dead yet, it is in a critical state according to The Guardian. The same article highlights that almost a quarter of the entire maritime ecosystem contains bleached coral, and the reef is continuing to bleach at an alarming rate. Corals are living marine organisms and have a symbiotic relationship with tiny algae called zooxanthellae, which gives the coral its vibrant color. According to National Geographic, warming ocean waters stress the coral and cause it to expel the algae, which leads to the bleaching of the reef. 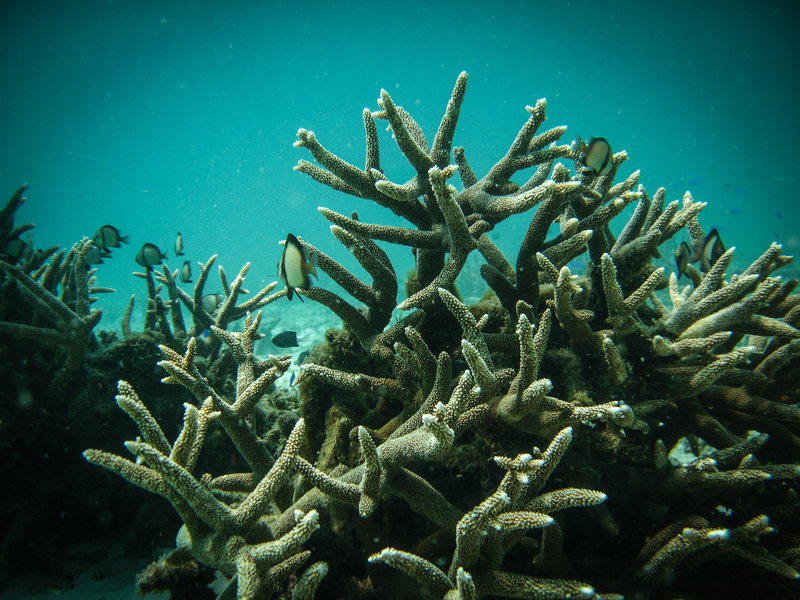 Although, in some cases, the coral can recover, many organisms do in fact die, leaving an ominous grey exoskeleton. This alarming phenomenon is not isolated to the Great Barrier Reef, with evidence proving that all coral species are at risk. Bleaching is thought to be caused by a combination of the warm El Ñino current and climate change, according to The Guardian. It’s definitely troublesome to see the general public only caring about the reef once it’s been pronounced dead by some travel magazine. We should all be thinking about this ecosystem and our environment as a whole. Collectively, we humans have contributed to the decimation of the Great Barrier Reef—amongst other natural disasters—by exploiting the planet’s resources and producing unfathomable amounts of waste. We’ve screwed up bigtime, and it’s important to realize that all of our actions—even halfway across the world in Montreal—can have a direct impact. “But what can we do here at Concordia?” You may wonder, and the answer is right before your eyes. The Concordia Student Union (CSU) recently announced by-elections, which will take place from Nov. 15 to 17. There are two referendum questions that address the university’s environmental status. The first referendum asks whether the student population agrees with the demands of Divest Concordia, in asking the university to remove all of its investments in fossil fuels and “related industries.” The goal here is to reinvest in something more sustainable in regards to the environment. The second question asks whether the CSU should support the fossil fuel divestment campaign until the university has completely divested from these assets. Every small action that we take, collectively, adds up to big change. Take public transit instead of driving. Recycle. Compost. Reduce your beef intake and switch to more sustainable sources of protein. We are all to blame for the damage inflicted on the Great Barrier Reef, as well as the rise in global temperatures. Wasting time pointing fingers and shifting the blame won’t take away the fault that rests on each of our shoulders. Here at The Concordian, we ask that students become more environmentally conscious, and understand that our planet is in a dire state. Now before you call us hippies, we fully support these two referendum questions and urge the entire student body to vote yes in the upcoming by-elections. Also, please recycle our newspaper once you are done reading it.